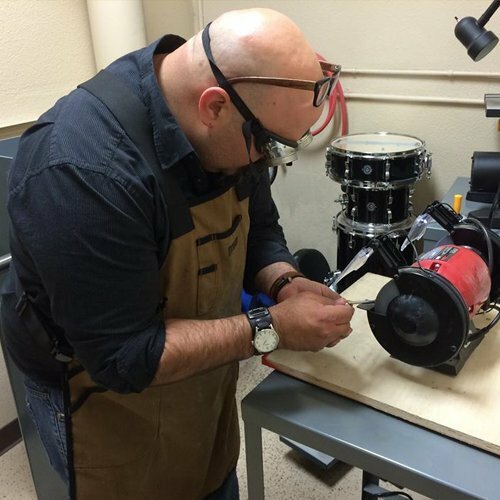 Bridgepoint Music is the go-to shop for quality instrument repair for Menlo Park, Redwood City, Palo Alto, and the greater Peninsula. We strive to keep our estimates as accurate as possible, and the best part is, they’re free of charge! However, if something unexpected should come up during the instrument repair work that would require us to adjust the cost, you will be notified, and we’ll wait until we can get your approval before proceeding. We will provide an explanation of the work we recommend as well as an estimate of the time and cost involved. The list below is just a snapshot of the services provided. We understand you want to take care of your instrument investment, which is why we go above and beyond to repair it. We do everything from straighten keys and replace springs on woodwind instruments to replace pads on flutes, provide saxophone repair and more. See what else we can do below! The flute is disassembled; knock pins are removed and key clusters are disassembled; body, foot, head joint and crown are ultrasonically cleaned; rods and screws are cleaned, polished, and lubricated; entire instrument is hand-polished and reassembled; head joint cork is replaced; keys are straightened; instrument is regulated and adjusted; pads are reseated; instrument is play-tested for optimum performance. Note- The clean/oil/adjust job is for flutes that need a little more than the standard playing condition, but less than a full re-pad. It is ideal for older flutes whose pads are still in good condition, or as preventative maintenance on higher-end flutes. 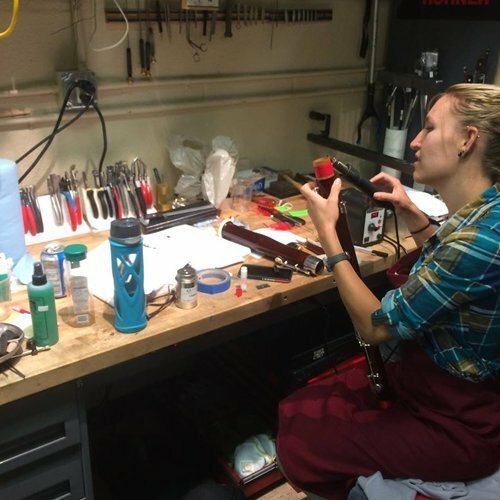 Flute is disassembled and ultrasonically cleaned; rods and screws are cleaned, polished and lubricated; keys are straightened; tenons are fit; all pads are replaced; all key corks are replaced; springs are adjusted or replaced as needed; head joint cork is replaced; minor dents are lifted (large dents may incur an extra charge); instrument is reassembled, regulated and adjusted; instrument is thoroughly play-tested; instrument is polished. Flute is disassembled and ultrasonically cleaned; rods and screws are cleaned, polished and lubricated; tone holes are leveled as warranted; keys are straightened; keys are fit; tenons are fit; all pads are replaced; all key corks are replaced; springs are adjusted or replaced as needed; head joint cork is replaced; minor dents are lifted (large dents may incur an extra charge); instrument is reassembled, regulated and adjusted; instrument is thoroughly play-tested, instrument is polished. Flute is disassembled and ultrasonically cleaned; rods and screws are cleaned, polished and lubricated; tone holes are made perfectly level; keys are straightened; keys are precision fit; tenons are fit; all pads are replaced; all key corks are replaced; springs are adjusted or replaced as needed; head joint cork is replaced; minor dents are lifted (large dents may incur an extra charge); instrument is reassembled, regulated and adjusted; instrument is thoroughly play-tested; instrument is polished. Flute is disassembled and ultrasonically cleaned; rods and screws are cleaned, polished and lubricated; tone holes are made perfectly level; keys are straightened; keys are precision fit; tenons are fit; all pads are replaced with Straubinger flute pads; all key corks are replaced; springs are adjusted or replaced as needed; head joint cork is replaced; minor dents are lifted (large dents may incur an extra charge); instrument is reassembled, regulated and adjusted; instrument is thoroughly play-tested; instrument is polished. The next best thing to having a split-E mechanism on your flute. We will install a small “donut” made of delrin under the lower pad of your double-G key. Your high E’s will speak much more clearly. The most over-looked leak on any flute! If you can freely twist, push or pull your head joint crown, it is time for a new head joint cork. If it has been more than a year since you had your head joint cork replaced, it is time for a new head joint cork. If your tuning is very inconsistent and you’re not sure why, it is time for a new head joint cork. Flute joints may become too tight from dents or dirt, or could become too loose from wear. Or perhaps you’re upgrading to an after-market headjoint. Whatever the case may be, we will get it fitted properly. Clarinet is disassembled; keys and body are ultrasonically cleaned; rods and screws are cleaned, polished and lubricated; keys are straightened; all pads are replaced; all key corks are replaced; all tenon corks are replaced; springs are adjusted or replaced as needed; instrument is reassembled, regulated and adjusted; instrument is thoroughly play-tested. Clarinet is disassembled; keys are ultrasonically cleaned; body is cleaned in wood-safe soap, then oiled; rods and screws are cleaned, polished and lubricated; keys are straightened and fit; tone holes are leveled as warranted; all pads are replaced; all key corks are replaced; all tenon corks are replaced; springs are adjusted/replaced as needed; instrument is reassembled, regulated and adjusted; instrument is thoroughly play-tested. Clarinet is disassembled; keys are ultrasonically cleaned; body is cleaned in wood-safe soap, then oiled; rods and screws are cleaned, polished and lubricated; keys are straightened; keys are precision fit; tone holes are filed and leveled to correct factory inaccuracy; all pads are replaced; all key corks are replaced; all tenon corks are replaced; springs are adjusted or replaced as needed; instrument is reassembled, regulated and adjusted; instrument is thoroughly play-tested. Clarinet is disassembled; keys are ultrasonically cleaned; body is cleaned in wood-safe soap, then oiled; rods and screws are cleaned, polished and lubricated; keys are straightened; keys are precision fit; tone holes are filed and leveled to correct factory inaccuracy; all pads are replaced with Valentino Masters Pads; all key corks are replaced; all tenon corks are replaced; springs are adjusted or replaced as needed; instrument is reassembled, regulated and adjusted; instrument is thoroughly play-tested. Clarinet is disassembled; keys are ultrasonically cleaned; body is cleaned in wood-safe soap, and then oiled; rods and screws are cleaned, polished and lubricated; keys are straightened; keys are precision fit; tone holes are filed and leveled to correct factory inaccuracy; all pads are replaced with kangaroo pads; all key corks are replaced; all tenon corks are replaced; springs are adjusted or replaced as needed; instrument is reassembled, regulated and adjusted; instrument is thoroughly play-tested. Clarinet is disassembled; keys are ultrasonically cleaned; body is cleaned in wood-safe soap, then oiled; rods and screws are cleaned, polished and lubricated; keys are straightened; keys are precision fit; tone holes are filed and leveled to correct factory inaccuracy; all pads are replaced (with cork pads where appropriate); all key corks are replaced; all tenon corks are replaced; springs are adjusted or replaced as needed; instrument is reassembled, regulated and adjusted; instrument is thoroughly play-tested. Clarinet is disassembled; keys are ultrasonically cleaned; body is cleaned in wood-safe soap, and then oiled; rods and screws are cleaned, polished and lubricated; keys are straightened; keys are precision fit; tone holes are filed and leveled to correct factory inaccuracy; all pads are replaced with Straubinger clarinet pads; all key corks are replaced; all tenon corks are replaced; springs are adjusted or replaced as needed; instrument is reassembled, regulated and adjusted; instrument is thoroughly play-tested. Cracks tend to head toward where the wood is thinnest, and unluckily for clarinets and oboes, that usually means they head for tone holes. Because of stuff getting in the way (keys, posts, tone holes, etc. ), pinning is usually the best way to go for crack repair. The average crack will require 2-5 pins. Banding is an ideal way to get a crack repaired, but can only be performed when there is nothing in the way (keys, posts, tone holes, etc.). Why risk it? Is the cork getting dry in your saxophone or clarinet? Don’t wait until the day of your performance to let it fail. Get it replaced now! We use only grade AAA-AAAA natural sheet cork on all recork jobs at Bridgepoint Music. 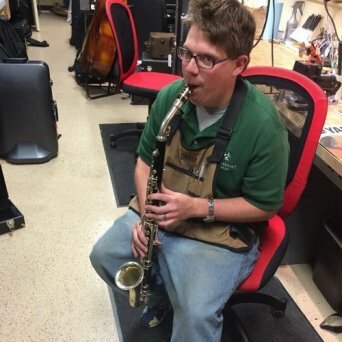 Saxophone is disassembled and ultrasonically cleaned; rods and screws are cleaned, polished and lubricated; tone holes are leveled as warranted; keys are straightened; neck tenon is fit; all pads are replaced; all key corks are replaced; neck cork is replaced; springs are adjusted or replaced as needed; minor dents are lifted (large dents may incur an extra charge); instrument is reassembled, regulated and adjusted; instrument is thoroughly play-tested. Saxophone is disassembled and ultrasonically cleaned; rods and screws are cleaned, polished and lubricated; tone holes are made perfectly level; keys are straightened; keys are precision fit; neck tenon is precision fit; all pads are replaced; all key corks are replaced; neck cork is replaced; springs are adjusted/replaced as needed; minor dents are lifted (large dents may incur an extra charge). ; instrument is reassembled, regulated and adjusted; instrument is thoroughly play-tested. Saxophone is disassembled and ultrasonically cleaned; rods and screws are cleaned, polished and lubricated; tone holes are made perfectly level; keys are straightened; keys are precision fit; neck tenon is precision fit; all pads are replaced with either Roo Pads (white in color) or Saxgourmet Pads (black in color); all key corks are replaced; neck cork is replaced; springs are adjusted or replaced as needed; minor dents are lifted (large dents may incur an extra charge); instrument is reassembled, regulated and adjusted; instrument is thoroughly play-tested. Note- There are many different options available for saxophone repads. Do you want standard pads, or kangaroo? If kangaroo, what color? What type of resonator? What type of resonator material? Specialty pads may need to be special-ordered, but we are glad to do it! The sky is the limit. Don’t hesitate to inquire about your options. Additional spring installed on G# touchpiece. G# key is outfitted with a kangaroo pad. Necks leak! It’s a sad fact of life that most necks are not precision fit at the factory. Look at your neck tenon. Are some spots more polished than others? If so, your neck isn’t doing all it can to help you sound better. We use a specially designed neck expander to make your neck extra snug, and then lap it to perfection for an even fit. Added stability on all notes utilizing the right hand. These bars are becoming more and more common on upper-end saxophones. They can be seen on Saxes from Yanagisawa, Saxgourmet, and Buffet, just to name a few. Eliminate that pesky gurgle in your low C-B region. As air travels around your saxophone’s bow, the air on the inside track will reach its destination prior to air traveling on the outside track. This creates turbulence and results in a gurgle. Installing a baffle in your bow will correct the problem, and it’s a more graceful solution than dropping an end plug/mouthpiece cap/wine cork down your instrument’s bell. Not to toot our own horn, but we do the best and most thorough cleanings in the area. 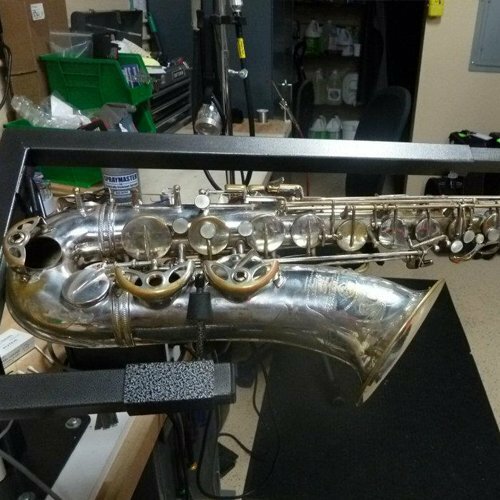 Your instrument will be completely disassembled – and we mean completely; everything that is meant to come apart will be taken apart. 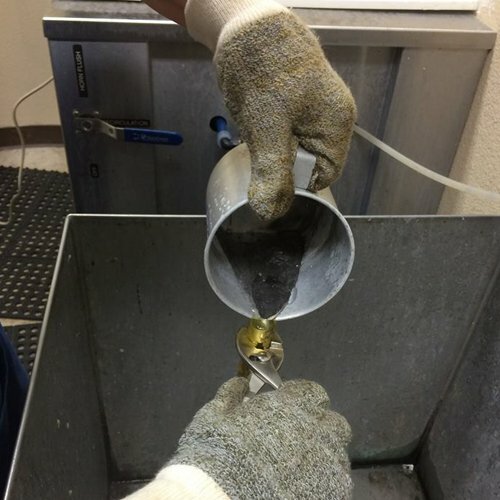 Your instrument will be degreased and cleaned in our 90 gallon Ultrasonic Cleaner. It then gets rinsed and cleaned again “Texas Flush” style using brushes in a high-speed pneumatic drill and our special blend of soap and pumice. Tuning slides are hand-polished. Everything is thoroughly rinsed for a second time and dried. The instrument is lubricated with top-quality, synthetic lubricants and reassembled. The instrument is lightly polished and returned to a freshly-vacuumed case. Put our Ultrasonic Cleaning up against the cleaning job done by “the other guys.” You won’t be disappointed. Damaged valve, damaged casing, or both? We will figure it out and get your instrument functioning properly again in no time. Think of solder as a very strong adhesive. If there is too much stress, or the adhesive gets worn out, it needs to be replaced. Soldering has many variables (solder type, if the piece is bent, if the piece is dirty). Every solder job is different. We can solder your instrument back together and clean up after ourselves. Due to the nature of dent repair, we will need to see your instrument in person before we can provide an estimate, however, we can usually estimate it for you on the spot. We fix cases too! Protect your instrument in a durable case. If your case needs a new handle, latch or hinge, come see us. If you have any questions, would like an estimate, or want to schedule repair or cleaning service, call us today! 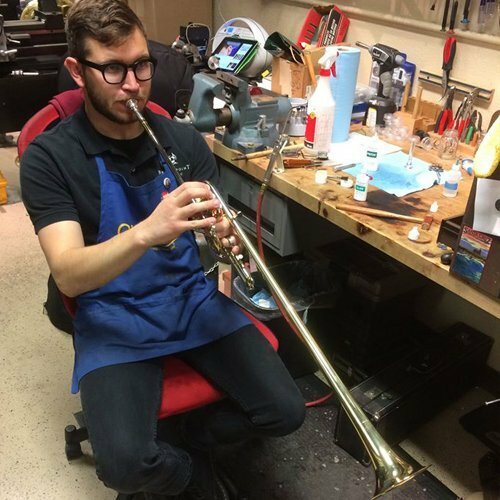 For anyone in the Palo Alto and Redwood City, CA area in need of musical instrument repair, Bridgepoint Music offers a convenient and cost-effective solution. Give us a call or stop in today for an estimate!